Professors often want you to use information that is research-level, verified, and includes citations of the work the authors used. They often refer to these articles as scholarly, academic, refereed, or peer-reviewed. Wikipedia and other sources like it are a great place to start gathering information, but should not be used as the sole basis of your papers. 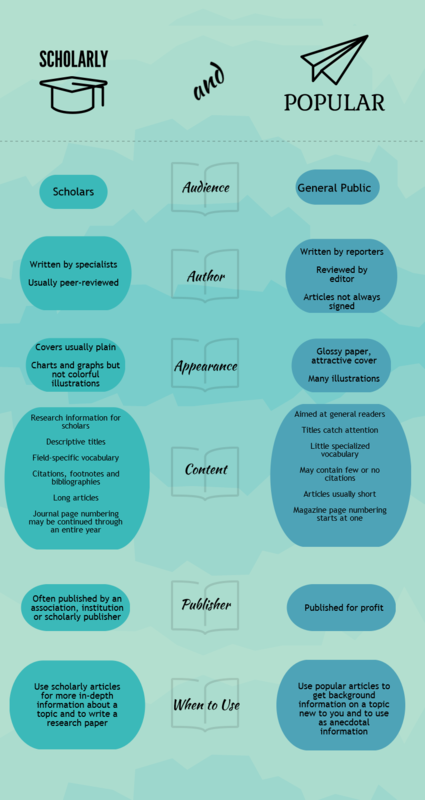 Use this table to help determine what type of journal you have, however it can sometimes be difficult to determine whether a journal is scholarly or popular so Ask A Librarian when you need help.